The Wicker Park Bucktown (WPB) Chamber of Commerce, sole service provider of Special Service Area (SSA) #33, has been named an official American Express Shop Small® Neighborhood Champion, in honor of the chamber’s annual ChillFest pop music festival supporting local businesses in Wicker Park and Bucktown on Small Business Saturday, Nov. 25 from 2-6 p.m.
Shop Small® is sponsoring the 100+ local musicians performing in this year’s ChillFest, presented in dozens at the start of the holiday shopping season. Each business hosts 3-4 artists in a dedicated portion of its space, with musicians playing 20- to 60-minute sets. 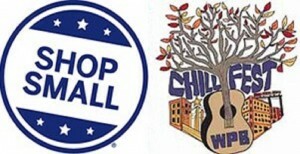 Schedule and more information available at www.chillfestchicago.com. The Wicker Park Bucktown Chamber of Commerce serves as a cornerstone of the Wicker Park and Bucktown commercial districts, advancing the financial goals of neighborhood businesses through the creation of a dynamic economic climate, increasing the neighborhood’s visibility and viability, and encouraging profitable relationships within the community. The Chamber administers Special Service Area (SSA) #33, guided by a Commission of SSA taxpayers who serve on active committees. For more information, please visit www.wickerparkbucktown.com.